As April rolls in, you’ll begin to see summer supplies fill store shelves in preparation for the warmer months. Tanning oil, beach towels, sunglasses, and bathing suits will be among the most sought-out items of the season. 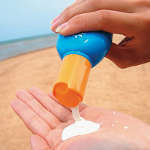 A recent study suggests that sunscreen and other sun safety products will most likely be left behind, even by those who should know better. The study of nearly 27,000 people released by Yale University on Monday revealed that skin cancer survivors are just as likely to neglect the necessary precautions for skin safety. When compared to cancer-free peers of the same class, age, race and insurance coverage, the use of sunscreen was the only considerable difference among those who have already had skin cancer. “In other words, a 40-year-old white person with insurance coverage who has been through cancer treatment is just as likely to use a tanning bed or go outside without a wide-brimmed hat as one who has not,” reports USA Today’s Kim Painter. So in the spirit of fun in the sun, consider the following safety tips. Repetitious as they may seem, you can’t have enough good advice, as we see in the above study. According to the American Society for Dermatologic Surgery, the risk of melanoma-related death can be reduced by 50%, just by following this simple step. And remember, reapply! Some of the worst sunburns are the result of a quick swim that easily washes even ‘waterproof’ sunscreen away.